I had been on Broadway and was the "Rock & Roll Cat" in the US National Tour of “Cats”, a songwriter, record producer for CBS, and actor co-starring in movies for Paramount & Columbia Pictures. I blew out my voice at 24 years old and could not talk at all for 3 years. I wrote on a notepad to communicate. It ended my career, and sent me on a spiritual quest. Many of the people in the entertainment business that I knew were into the popular New Age spiritual movement. They liked it because they had a spiritual thirst but they did not want any path that made moral demands on them. I was very intrigued by what I found in many circles in New York, a mixture of eastern mysticism and western paganism. I was reading Shirley McClain's "Out on a Limb" and every other book I could find. As an actor I had saved up money from movie royalties and shows, but I was going through it quickly by traveling to retreats and seminars. I studied temple style Tai Chi, Chi Kung, and five elements meditations, the Microcosmic Orbit meditation with master Mantak Chia in New York and Boston. I was a regular at the New York Integral Yoga Institute and its Connecticut retreat centre. I did EST with Werner Erhard, the 8 day in San Francisco, and the Forum which later became Landmark. I meditated several hours every day. I became a regular at psychic fairs in New York City and Montreal. I visited transmediums and spoke with spirits "on the other side" through seances. It was all very exciting because I could clearly see that there is a spiritual realm. As a person who had been a nonbeliever this was electrifying. It seemed very good. I was having cool spiritual experiences. Maybe I could live forever. I started to believe that maybe I had lived many lives before and would be here again. I thought reincarnation was a great idea. It was the only way that could get my head around the idea of becoming spiritually perfect before entering Nirvana. (1) Swami Satchidananda, my guru to whom I dedicated 4 years, told me that Jesus was an ascended master who had been through many lives. My guru said I could be as spiritually advanced as Jesus if I followed the Guru's instructions. He never told me to follow Jesus' instructions. I was told "what is true for me might not be true for you" and that everyone had their own reality and moral compass. No moral law was binding. I felt that every path up the spiritual mountain led to the "summit." I did not realize that many paths lead into avalanches and insurmountable cliffs. My key word was "tolerance." I thought I was practicing religious tolerance because I was drawing from many religions. In trying to take the "best" from every religion, the path I was pursuing left behind moral laws and practises that required true discipline, even ones in the ancient religions from which it drew. There were occasional ominous warnings. One day after I was back in Ottawa, I was walking out of a seance session, and I was wondering if I should start training to become a transmedium which was to begin the following week. It was raining and my foot kicked a piece of paper in a puddle. For some reason I picked it up. It was a torn page from a religious magazine. There were only a few lines of text on it. It said "entities on the other side are fallen angels and they are very dangerous." I looked around as if someone was looking over my shoulder. I decided not to do the training. I would get heavily involved in an organization when a strange twist of circumstances would pull me out. Then I'd look for another organization. As I got deeper and deeper into my journey, I occasionally had a shadowy feeling that I was treading on thin ice but was reassured myself that I was on the path to Truth. I thought that there was no such thing as evil. Bad stuff in the world was only a result of ignorance which could be conquered by personal enlightenment. I was convinced that the devil was a medieval myth made up by an archaic church to control the masses. The idea of sin was ridiculous to me. Although for thousands of years humans have acknowledged the existence of a creative intelligent malevolent creature whose purpose was to ruin the hearts and lives of humans, I felt I was right. There was little caution in my spiritual "openness." I didn't realize after three years of spiritual kite flying, I was becoming a lightning rod for whatever spiritual disruption was out there. My resistance to spiritual attack had been broken. Perhaps one of the greatest victories the devil had in my life was to convince me that he doesn't exit. One night, during a meditation, I was opening up chakras which are spiritual channels in the body. I had done this many times before but this night was different. I began to feel a thickness in the air. An eerie feeling came over me. I was not alone. It came closer. It surrounded me. Then I realized that I was being surrounded by many disturbed "entities." I could feel them all around me - dozens of them. I tried to shake them away but they came closer. There was a slimy feeling to it all, yet at the same time I had a sick attraction to it - I was giving in! The protection of God was waning because I had drifted away from it. I had gone into a spiritual forest alone and these spirits were descending on me. I limply said "someone help me." Yet at the same time I was giving in even though I didn't want to give in. I could feel them starting to take control (Mat 12:45). It was like nothing I'd ever experienced before in my life. I did not follow up this experience of Jesus. I did not join a Church. I did not join a Christian community of believers. I tried to go it alone in this spiritual journey. This was a big mistake. I began to think I could mix Jesus with the occult. The allure of the occult came back. (Mat 21:12) Swami Satchidananda, who I had followed in New York, was going to be in Montreal. I decided I wanted to completely devote myself to him as a Sanyasan. I went to Montreal to meet him. I was to be given a new name. I was going to abandon everything and move to a little town in Virginia called "Yogaville." I took the bus to Montreal. In Montreal, I lost my way and got off the bus. I looked up and saw a huge Church. I was struck by its beauty and majesty. I thought to myself, "I'll just go in here for a few minutes before I try to find my way and meet the Guru." I walked into the Church and saw elderly women whispering prayers with their heads bowed. I was very moved and said to myself "These women have faith! Maybe there is something here for me. Maybe the Church isn't a cold stone building full of hypocrites" - which was the New Age spiritual pride that I had before that moment. A peace descended on me. I got up and lost all interest in the Guru and the cult. I was infused with the Holy Spirit. I had no need for the Guru, I had Jesus! He knew all about the spiritual channels in my body, He knew how to inspire me to pray. That was over 20 years ago. Since then, Jesus has been with me each and every day. My voice came back pretty well and I've been given a Christian music ministry. It has taken me to India, the Caribbean, Europe, Poland, Guatemala, Australia, and across North America. 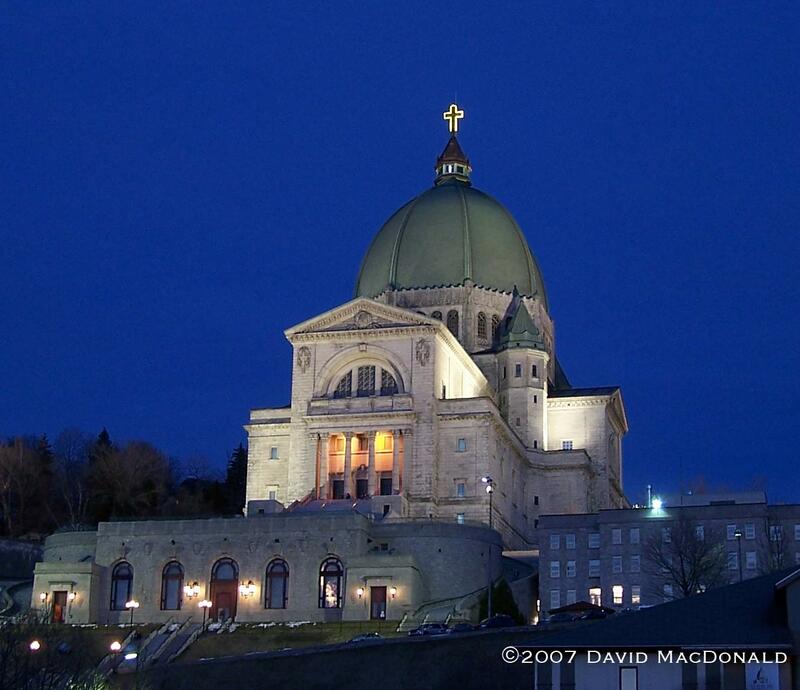 I recently visited the Oratory in Montreal. I realized it is on Queen Mary Street in Montreal. The same street name as the one I grew up on in Ottawa, where I had an experience looking at a Church at 8 years old. Praise the Lord Jesus, the One and only Redeemer. What have I learned about Relativism? Relativism is a legacy of the New Age. We don't think the Truth requires our belief in it. I can guess on the number of stars in the universe yet my belief will have no bearing on how many stars there are in the universe. There is a set number of stars and God knows what it is. Whatever "truth" we believe about it doesn't change it. I have a blind friend. He didn't believe there was a car coming down the street. That was his Truth. He was wrong. The car hit him and broke his leg (true story). The truth is absolute. It does not bow down to interpretations of it. We believe Jesus is the Truth. Notes: (1) Buddhist Nirvana is similar to the Christian Heaven in some respects, however a significant difference is that in Heaven there is supreme joy whereas Nirvana promises freedom from desire. In Buddhism, the belief is that people who achieve Nirvana have no individuality at all, everyone becomes part of the great ohmmmm. In Heaven we will enjoy perfect unity with all others in heaven yet in some mysterious way we will be completely unique and individual. Hugh's full testimony is here. It is about a 45 minute read.